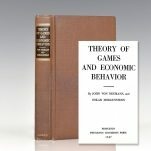 Theory of Games and Economic Behavior. 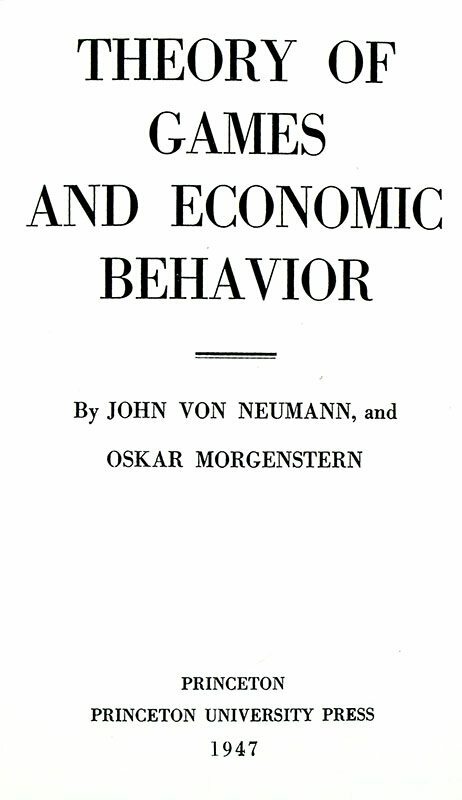 Von Neumann, John and Oscar Morgernstern. Princeton: Princeton University Press, 1947. Second edition of the author’s groundbreaking work on game theory. Octavo, original cloth. Light red pencil marginalia in the text, very good. “One of the major scientific contributions of the first half of the 20th century” (Goldstine & Wigner). 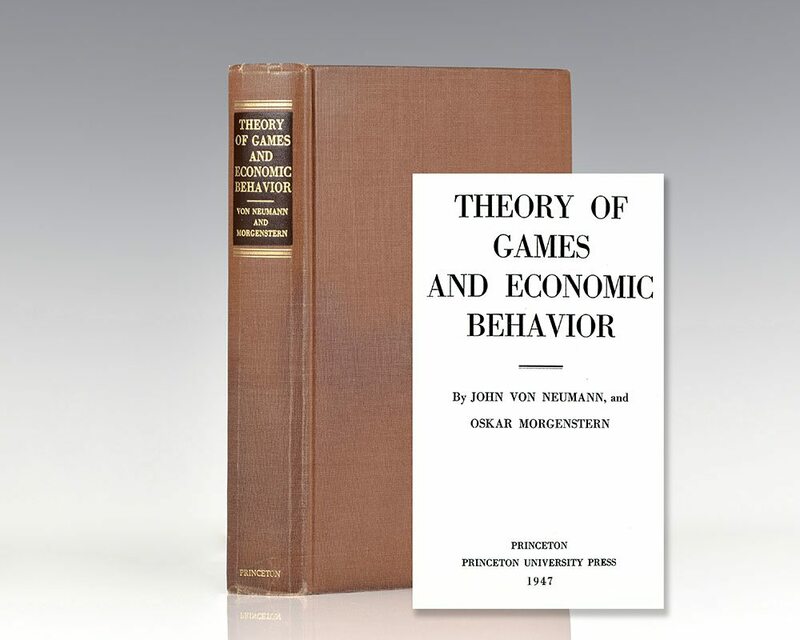 “Had it merely called to our attention the existence and exact nature of certain fundamental gaps in economic theory, the Theory of Games and Economic Behavior… would have been a book of outstanding importance. But it does more than that. It is essentially constructive: where existing theory is considered to be inadequate, the authors put in its place a highly novel analytical apparatus designed to cope with the problem. It would be doing the authors an injustice to say that theirs is a contribution to economics only. The scope of the book is much broader. 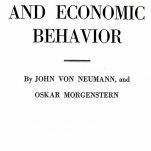 The techniques applied by the authors in tackling economic problems are of sufficient generality to be valid in political science, sociology, or even military strategy. The applicability to games proper (chess and poker) is obvious from the title. Moreover, the book is of considerable interest from a purely mathematical point of view… The appearance of a book of the caliber of the Theory of Games is indeed a rare event” (World of Mathematics II:1267-84). First edition of this classic bestseller, which has sold over 100 million copies. Octavo, original cloth. Boldly signed by Napoleon Hill on the front free endpaper. Near fine in a near fine dust jacket. Housed in a custom half morocco clamshell box. This is the first example of a first printing we have seen signed. Rare and desirable. New York: Harper & Brothers Publishers, 1904. 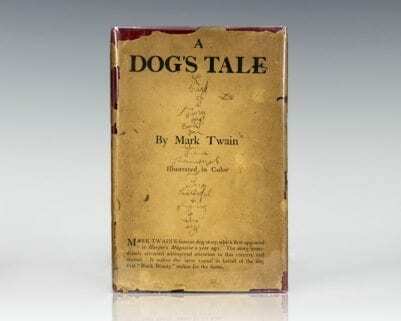 First edition of Twain’s famous dog story. Octavo, original cloth. Contemporary inscription to the front free endpaper, near fine in the rare original dust jacket with wear and tear and some writing on the front panel. Illustrations by W. T. Smedley. BAL 3483. Courrier Sud, Vol de Nuit, Terre des Hommes and Pilote de Guerre. Early printings of Saint-Exupery’s first four books. Octavo, four volumes bound in contemporary cloth. Each volume lengthily inscribed by Antoine de Saint-Exupery on the half-title page. In the author’s first novel, Courrier Sud, “Pour Madame Stokes, Avec le hont que j’eprouve a signer ce pache de jeunesse. Et en respectueux hommages Antoine de Saint-Exupery.” In his second novel, Vol de Nuit, which deals with his experiences as an airmail pilot, “Pour Madame Stokes, cher que’on retrouve une atmosphere de France en respectueux hommages Antoine de Saint- Exupery.” In his third novel, Terre des Hommes, which went on to win the Grand Prix of the Académie Française, “Pour Madame Stokes, en souvenir d’une epoque recuse ou la Terr des Hommes etait en pix et en respectueux hommages Antoine de Saint- Exupery.” And, finally, in Saint-Exupery’s Pilote de Guerre, his memoir of his role in the French Air Force as pilot during the Battle of Paris in 1940, “Pour Madame Stokes, ces souvenirs d’une pilot de ligne change en Pilote de Guerre et en hommage respectueux, Antoine de Saint-Exupery.” Each volume is in very good condition. An exceptional collection. 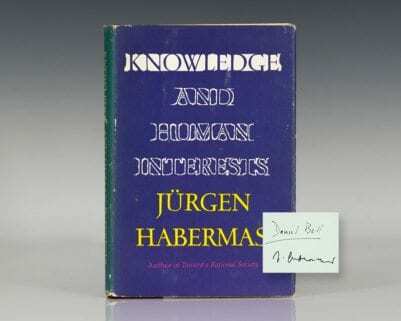 First edition in English of Habermas’ classic work. Octavo, original half cloth. Signed by Jurgen Habermas on the front free endpaper. Sociologist Daniel Bell’s copy, with his signature and his extensive notes throughout. Translated by Jeremy J. Shapiro. Near fine in a very good dust jacket. Jacket desiged by Richard C. Bartlett.